Number of internally displaced people currently in Amhara region of Ethiopia is now over 80,000. The number represents displaced people from the region and other parts of Ethiopia, according to a report by Amhara Mass Media Agency (AMMA). About 46,000 of them are people recently displaced from central Gonder region following violence allegedly involving Amhara and Qimant Communities; the regional government security authorities claim that the conflict is Dembia region is rather a proxy one financed and armed by Tigray People’s Liberation Front (TPLF). The skirmish on February 7, 2019 left two kebeles entirely destroyed and dozens of people were killed. The rest of displaced people in the region are from outside of the region specifically from Benishangul Gumuz, Oromia and Somali regions of Ethiopia, according to Amhara Region Communication Head, Asemahegne Asres. Those who are displaced from Dembia region, about a week ago say that government is not providing them with adequate emergency food aid. About 2700 were not provided with any form of aid, according to AMMA report yesterday. 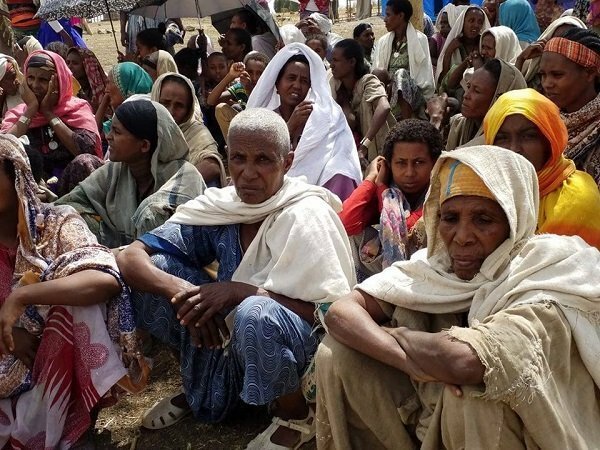 Amhara Region disaster prevention and food security coordination office, on the other hand, says that it is working to resolve demands raised by displaced people. According to a report published today by AMMA, the regional government allocated over 35 million birr to support the displaced from from different parts of the region and is now beyond the capacity of the regional government, said Asemahegne Asres. And the region’s government is now soliciting support in kind; cash or other forms for the displaced people need long term support. To that effort, the region’s government already established a task force to coordinate support for IDPs. The region also disclosed Bank account numbers to which people could send their financial contribution to support displaced people in the region. Calm is not yet restored in the parts of central Gonder region that experienced violence last week albeit the regional government managed to seize 43 AK 47 and over 1000 ammunition. Ethiopia has now become the leading country the world over in terms of number of internally displaced displaced people. And most of it happened after Prime Minister Abiy Ahmed took over as prime minister of the country.